2) retrieve a Judge Supporter card from your discard pile (and presumably use it again). I LOVE – LOVE LOVE LOVE – that Pokemon has committed to making more Trainer cards that do more than one thing. They provide SO much flexibility. I have been playing Tate & Liza a LOT lately, and I’m pretty sure at this point I’d rather run T&L than Erika’s (so sorry I totally overrated Erika’s, that was a HUGE mistake on my part). Judge Whistle actually has great synergy with Magcargo. You can use Smooth Over to get the card you need instantly, or if you play the Judge and get stuck without a draw card afterward, you can use Smooth Over then to ensure you get what you need on the following turn as your top deck. As far as the effectiveness of Judge, it’s definitely a disruptive card, but it seems like every time someone plays it on me early – or if I play it on someone early – they still manage to get a draw Supporter in hand after the Judge. And I feel like I can’t play Judge when my opponent only has three or two (or less!) cards in hand. I just don’t want to put more cards in their hand, especially when there’s such a good chance that they might be stuck. Finally, so many players are running Zoroark GX, Swampert, Magcargo, Oranguru, Zebstrika and now Pidgeot or whatever other cards that will help them draw cards without relying on Supporters. My general rule of thumb is that if you have a deck with an internal draw support mechanism (see above paragraph for examples), you should try to run Judge. I had tried it with Swampert Magcargo before and decided I had to go with Cynthia because it just struggled way too much early on. This week, I tried it again with Swampcargo and went 2 W 2 L (with both the Whistle and the Judge). I then tried it Judge Whistle and Judge in a Lapras TEU Blastoise TEU build and went 4 W 1 L. I did play Jirachi in both this and the Swampcargo builds… but we’ll talk about Jirachi next week. Let me just say that Jirachi serves as an excellent quasi draw mechanism, so don’t have to hold your breath when playing Judge as long as you can use Jirachi to help prevent yourself from getting stuck. I even tried Judge Whistle in a crazy Gengar and Mimikyu GX Ultra Necrozma GX deck. I again played Jirachi in this deck as well, but I also played Acro Bike and even Order Pad. I did not play Judge but only Judge Whistle. I also went 4 W 1 L with this deck as well, meaning I went a combined 10 W 4 L in three different archetypes with Judge Whistle. I think Judge Whistle is a card that will help you win games. At least on PTCGO, getting off to a good start is SO important, and with the potential to allow you to immediately pull a draw Supporter out of your discard, I think Judge Whistle will be in a lot of my builds going forward. The only reason I can think of to not play it is if you have no deck space, which is becoming an issue. If you have four Jirachi, four Escape Boards, four Rare Candy… all of a sudden that 60 cards gets pretty tight and you just might not have room for four Whistles. Other than that, however, if I can make room, I’m playing Judge Whistle. …really? A whistle? This is what qualifies as Top X material these days? As though I needed more judges crawling after me. Judge Whistle is an Item card, and it has two effects to choose from: the exciting “draw a card”, or put a Judge in your discard pile into your hand. For those who don’t know what Judge does, it’s a Supporter forces both players to shuffle their hands into their decks and then draw 4 cards each. On the one hand, I can understand why some people might call Judge Whistle good. It’s never a dead card, it will always replace itself, and it can bring back a card that is primarily used to disrupt your opponent’s plays. I get that. On the other hand, though, Judge Whistle is…extremely lacking. If you don’t have that Judge in the discard pile, you’ll just be playing the Whistle to draw a card, at which point it’s like Whitney but without using your Supporter for the turn. Think about it for a minute, I just compared this card to Whitney. Whitney!! 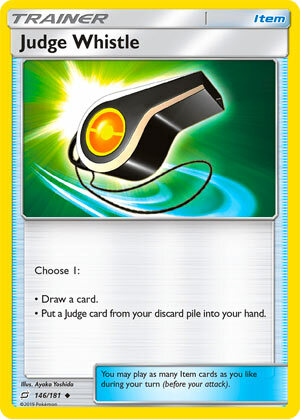 Now potentially you could have these Whistles to improve your deck’s consistency…though there are much better draw cards than Whistle, but you’re likely playing it for Judge more often than not, who might as well have the Standard seal of “N” on it since that’s usually why you’ll be playing Judge – to keep your opponent from amassing card advantage. Outside of Standard though, there are better drawing Items, and there are way better Supporters than Judge to use. That all being said, feel free to blow a whistle at all your friends. As long as they aren’t judges, they won’t come running towards you. Unless they’re angry at you. In which case I’d start running. Arora Notealus: Judge Whistle is a strange card. It’s something that one can see the appeal in using, but it doesn’t really do much on its own. You either improve your ability to draw what you want…or you Judge em. I feel like there are way better cards out there to look at, and I’m not sold on Judge Whistle being one of “the best” cards to work with. Next Time: Back from the depths of the Earth, an ancient power arises! We’re counting down our top 11 picks from the latest expansion, and Judge Whistle (SM – Team Up 146/181, 194/181) is number seven! This Trainer-Item gives you a choice between effects; you can draw a card or you can add a copy of Judge to your hand from your discard pile. The only real drawback to Item cards is how many effects in the game can punish you for running too many of them, so they don’t need to do too much to be useful, though some of the best have some very potent effects… so potent they may receive errata and the original version of the effect eventually shows up as a Supporter. So, is drawing a single card worth it as an Item? Reclaiming a copy of Judge from your discard pile? Individually, I’d say “no” but together it is a “yes” for some decks. Pokémon is not the kind of TCG where you’re starved for draw and search power, so desperate to delve into your deck, that it is worth sacrificing a slot just to draw a card because it effectively allowed you to run a smaller deck than was otherwise allowed. While decks do need to run a good deal of draw and search power, we have draw effects so potent that shuffling your hand into your deck and drawing four cards is seen as a mild penalty, worth an Item card to inflict on your opponent (a la Red Card). Some decks actually could benefit from a simple “Draw 1 card.” effect, but for most, the gain in speed and reliability isn’t worth the hit to the deck’s overall capacity and versatility, given all the other cards you could be running in the same slot. Even where we have combos that can benefit from drawing one card, like using it to follow-up using the “Smooth Over” Ability found on Magcargo (SM – Celestial Storm 24/168), we already have cards like Acro Bike, PokéNav, etc. to do the job. That is assuming it has to be an Item can can’t be an Ability. As for just adding Judge back into your hand from the discard, that would definitely not be worth it unless you had a competitive hand-synching deck, or perhaps a hand control deck that relied on Judge. Put the two together, however, and we’ve got something. Standard doesn’t have the kind of easy hand-disruption found in Expanded; messing with your opponent’s hand can be worth using a shuffle-and-draw Supporter that gets one or two cards less than the other typical options. Too many Supporters clutter a deck, though, so having Items you can “exchange” for that Supporter or just burn to draw a card? That’s nice. Space demands will still prevent Judge Whistle and Judge from becoming Standard Format staples, as well as the lack of an easy, reliable way to get your initial Judge into your discard pile from your deck. In Expanded, we have VS Seeker, so don’t bother unless you’ve got some ridiculously aggressive strategy. Perhaps a First Turn Lock or even the rare Donk deck that can still work in the modern game? Judge Whistle is a must-run for the Limited Format because almost every deck here is starved for more draw power! Our 7th place pick is Judge Whistle from Sun & Moon Team Up. It is an item card that lets you do one of the two options. -Put a Judge card from your discard pile onto your hand. For the perspective of drawing a card, it can be as consistent as getting the exact card you need after you’ve used Magcargo’s Smooth Over Ability, but no more than that. I don’t know the baseline of how acceptable the draw power is in an item card, but drawing a card whatsoever regardless of situation seemed decent. Other cards have the potential to draw more, but at some expense. If we look at the Expanded card pool, you have cards like Roller Skates that has a 50% chance of drawing 3 cards, Bicycle or Custom Catcher that draws cards until you have X cards in your hand, and Acro Bike which lets you look at the top 2 cards of your deck and picking one of them and discarding the other. For the perspective of putting a specific Supporter card from your discard pile onto your hand, it can be as useful if you’re going to use this card right away. Judge was first printed on HeartGold & SoulSilver and received multiple prints from XY BreakThrough, SM Forbidden Light, and even a Full Art print in SM Lost Thunder. This enables Judge to be used in Standard, Expanded, and the Legacy format. This Supporter card makes BOTH players shuffle their hand and draw four cards. With N gone, the only rival to Judge is Wicke and Marshadow from Shining Legends. The former is a Supporter that makes both players shuffle their hand into their decks and draw cards equal to the amount of cards in both players hand prior to shuffling those. Marshadow functions exactly like Judge, albeit being an Ability that works when you put it into play from your hand. If I were to think about how well Judge does, I would say that Judge is more playable in Standard than in Expanded. So does Judge Whistle fit in various decks? Again, it can be useful if you make it to be. Granbull decks might like this, as it can use the first effect to not gain hand size, or the second effect if it’s hand size gets past four cards. I already mentioned Magcargo getting you exactly what you need via Smooth Over Plus Judge Whistle combo. Beside those two, I can’t think of anywhere else where this card fits in. Still enough for me to give it a average score, because certain cards already made Judge Whistle useful. In Limited, the second effect is useless because there’s no Judge in that set, but the first effect can be used. If you pulled one, it could be an automatic inclusion. Judge Whistle gives you options, but one of the effects seems specialized and the other being underwhelming. Fortunately, even a underpowered effect can still be made useful from other cards. I did not have this card on my personal list.